Japan’s surrender following the detonation of atomic bombs over the cities of Hiroshima and Nagasaki ended the Second World War. More than 200,000 New Zealanders had served during six long years of war, and more than 11,500 had died. News of the Japanese surrender arrived in New Zealand at 11 a.m. on 15 August. As with VE Day in May, VJ Day events were regulated by officialdom. Once again the preparations had been considerable, and the celebrations generally ran smoothly. Sirens sounded immediately, a national ceremony was held, and local celebrations followed. Once more there were parades, bands playing, thanksgiving services, bonfires, dances and community sports meetings, and again there was a two-day public holiday. 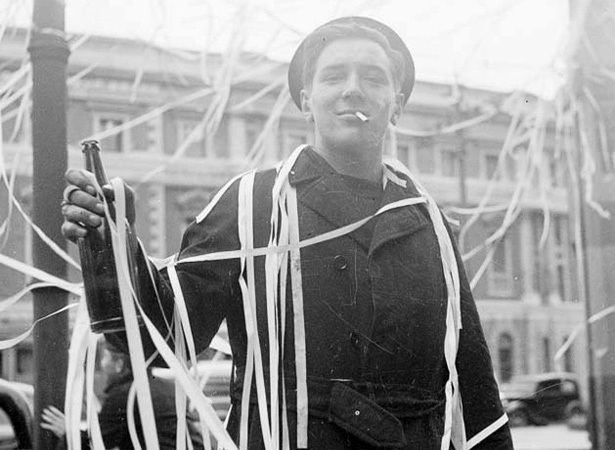 In Auckland, where fewer events were organised, people began to enjoy themselves the moment the factory whistle sounded, drinking, dancing and scattering confetti. Then rowdy elements began throwing bottles, windows were smashed and people were hurt. By evening, 51 had been taken to hospital and an estimated 15 tons of glass littered the streets. We have 9 biographies, 17 articles, related to The war is over! VJ Day.